In the lead-up to the Iraq War, I researched, wrote and circulated a document to members of Congress which explored unanswered questions and refuted President Bush's claim for a cause for war. The document detailed how there was no proof Iraq was connected to 9/11 or tied to al Qaeda's role in 9/11, that Iraq neither had WMDs nor was it a threat to the U.S., lacking intention and capability to attack. Unfortunately, not enough members of Congress performed due diligence before they approved the war. Here are some key questions which President Obama has yet to answer in the call for congressional approval for war against Syria. This article is a call for independent thinking and congressional oversight, which rises above partisan considerations. Claim 1: The administration claims a chemical weapon was used. The UN inspectors are still completing their independent evaluation. Who provided the physiological samples of sarin gas on which your evaluation is based? Were any other non-weaponized chemical agents discovered or sampled? Who from the United States was responsible for the chain of custody? Where was the laboratory analysis conducted? Were U.S. officials present during the analysis of the samples? Does your sample show military grade or lower grade sarin gas? Can you verify that your sample matches the exact composition of the alleged Syrian government composition? Further reading: Brown Moses blog; McClatchy News report; Global Research report. Claim 2: The administration claims the opposition has not used chemical weapons. Are you speaking of a specific group, or all groups working in Syria to overthrow President Assad and his government? Has your administration independently and categorically dismissed the reports of rebel use of chemical weapons which have come from such disparate sources as Russia, the United Nations and the Turkish state newspaper? Have you investigated the rumors that the Saudis may have supplied the rebels with chemicals that could be weaponized? Has the administration considered the ramifications of inadvertently supporting al Qaeda-affiliated Syrian rebels? Was any intelligence received in the last year by the U.S. government indicating that sarin gas was brought into Syria by rebel factions, with or without the help of a foreign government or intelligence agents? Claim 3: The administration claims chemical weapons were used because the regime's conventional weapons were insufficient. Who is responsible for the conjecture that the reason chemical weapons were used against the Damascus suburbs is that Assad's conventional weapons were insufficient to secure "large portions of Damascus"? Claim 4: The administration claims to have intelligence relating to the mixing of chemical weapons by regime elements. Who saw the chemical weapons being mixed from Aug. 18 on? Was any warning afforded to the Syria opposition and if not, why not? If, on Aug. 21 a "regime element" was preparing for a chemical weapons attack, has an assessment been made which could definitively determine whether such preparation (using gas masks) was for purpose of defense, and not offense? Further reading: McClatchy report; Brown Moses blog. Claim 5: The administration claims intelligence that Assad's brother ordered the attack. What is the type of and source of intelligence which alleges that Assad's brother personally ordered the attack? Who made the determination that Assad's brother ordered the attack, based on which intelligence, from what source? Claim 6: The administration claims poison gas was released in a rocket attack. Who was tracking the rocket and the artillery attack which preceded the poison gas release? Did these events occur simultaneously or consecutively? Could these events, the rocket launches and the release of poison gas, have been conflated? Based upon the evidence, is it possible that a rocket attack by the Syrian government was aimed at rebels stationed among civilians and a chemical weapons attack was launched by rebels against the civilian population an hour and a half later? Is it possible that chemical weapons were released by the rebels -- unintentionally? Explain the 90-minute time interval between the rocket launch and chemical weapon attacks. Has forensic evidence been gathered at the scene of the attack which would confirm the use of rockets to deliver the gas? If there was a rocket launch would you supply evidence of wounds from the rockets impact and explosion? What is the source of the government's analysis? If the rockets were being tracked via "geospatial intelligence," what were the geospatial coordinates of the launching sites and termination locations? Claim 7: The administration claims 1,429 people died in the attack. Secretary Kerry claimed 1,429 deaths, including 426 children. From whom did that number first originate? Claim 8: The administration has made repeated references to videos and photos of the attack as a basis for military action against Syria. When and where were the videos taken of the aftermath of the poison gas attack? Claim 9: The administration claims a key intercept proves the Assad regime's complicity in the chemical weapons attack. Will you release the original transcripts in the language in which it was recorded as well as the translations relied upon to determine the nature of the conversation allegedly intercepted? What is the source of this transcript? What was the exact time of the intercept? Was it a U.S. intercept or supplied from a non-U.S. source? Have you determined the transcripts' authenticity? Have you considered that the transcripts could have been doctored or fake? Was the "senior official," whose communications were intercepted, a member of Assad's government? How was he "familiar" with the offensive? Through a surprised acknowledgement that such an attack had taken place? Or through actual coordination of said attack? Release the transcripts! Was he an intelligence asset of the U.S., or our allies? In what manner had he "confirmed" chemical weapons were used by the regime? Who made the assessment that his intercepted communications were a confirmation of the use of chemical weapons by the regime on Aug. 21? What is the source of information that the Syrian chemical weapons personnel were "directed to cease operations"? Is this the same source who witnessed regime officials mixing the chemicals? Does the transcript indicate whether the operations they were "directed to cease" were related to ceasing conventional or chemical attacks? Will you release the transcripts and identify sources of this claim? Do you have transcripts, eyewitness accounts or electronic intercepts of communications between Syrian commanders or other regime officials which link the CW attack directly to President Assad? Who are the intelligence officials who made the assessment -- are they U.S. intelligence officials or did the initial analysis come from a non-U.S. source? Further reading: FAIR.org report and AP story; Washington Post editorial. Claim 10: The administration claims that sustained shelling occurred after the chemical weapons attack in order to cover up the traces of the attack. Please release all intelligence and military assessments as to the reason for the sustained shelling, which is reported to have occurred after the chemical weapons attack. Who made the determination that was this intended to cover up a chemical weapon attack? Or was it to counterattack those who released chemicals? How does shelling make the residue of sarin gas disappear? The American people have a right to a full release and vetting of all facts before their elected representatives are asked to make a decision of great consequence for America, Syria and the world. Congress must be provided answers prior to the vote, in open hearings, not in closed sessions where information can be manipulated in the service of war. We've been there before. It's called Iraq. 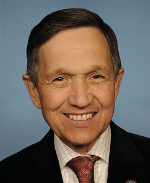 Dennis Kucinich is the former Democratic Congressman from Ohio's 10th district, who served from 1997 to 2013. He runs the Kucinich Action PAC.